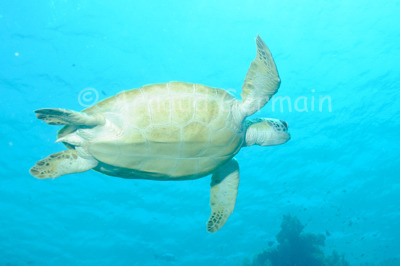 As this green turtle ascended towards the surface to breathe, I managed to swim below it to take this picture. This was something I had always wanted to do. I did it on the last dive of a school trip in Marsa Shagra bay. Nikon D700, Nikon 28-105 mm macro at 28mm, F9, 1/250th, ISO 400, Ikelite Housing and Ikelite DS160 strobe set on TTL.